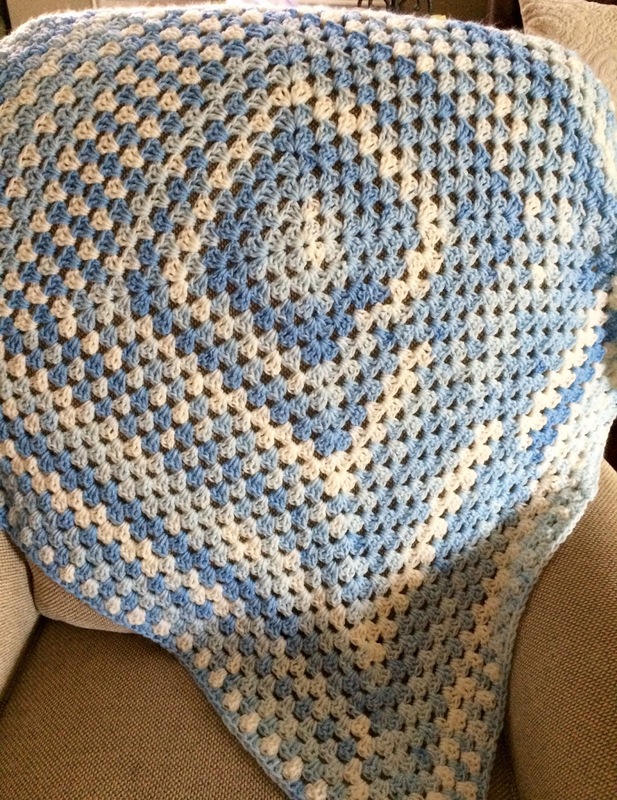 I made this granny square baby blanket for some young friends of mine that had their second baby boy, and thought I'd use it before I washed it for gifting. 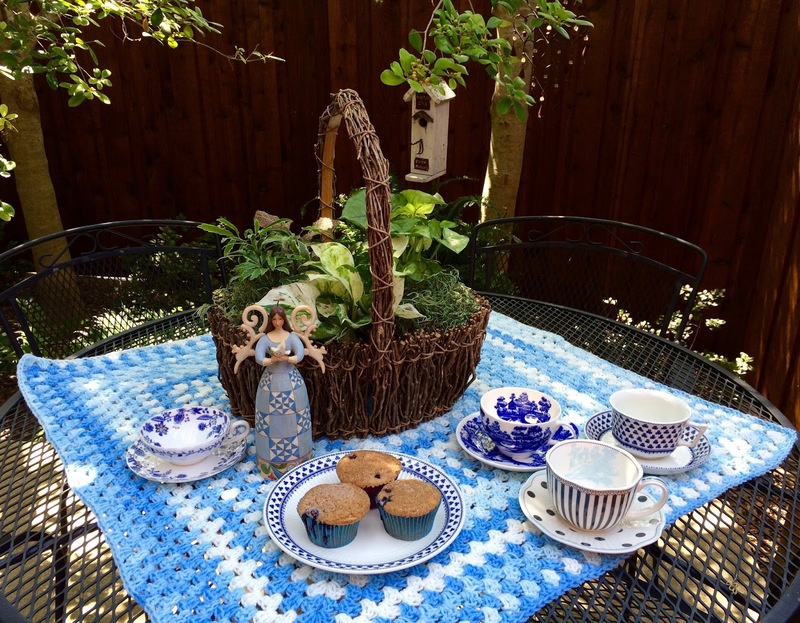 Since Fall has not officially arrived, let's enjoy some 100% Whole Wheat Blueberry Muffins with some of my pretty blue teacups, two of which I received from Stephanie's Teacup Exchange, from the The Enchanting Rose. I always keep this basket on my coffee table in the family room, filled with plants. Isn't the Jim Shore "Peace" angel so pretty? The two teacups on the left were from the teacup exchange from The Enchanting Rose. These muffins are so very moist and there are no eggs in the recipe (it's not a mistake!). I was very impressed with how wonderful they are. Preheat oven to 400 degrees. Lightly grease the cups of a muffin pan; or line with paper baking cups and spray the paper cups. In a separate bowl, whisk the vanilla, oil, and buttermilk. Pour the liquid ingredients into the dry ingredients, stirring just to combine. Spoon the batter into the prepared muffin cups, filling them nearly full. Sprinkle the tops of the muffins with the cinnamon sugar or sparkling sugar. Remove the muffins from the oven, and after 5 minutes, transfer them to a wire rack to cool. Serve warm or at room temperature. This blanket was a fun project using Ice Cream Scoop yarn that I bought on clearance from Michael's. Using variegated yarn makes crocheting much more interesting. Now the blanket is washed and ready to be gifted to the new baby. Oh so pretty in blue and white. Such a gorgeous crochet blanket, Kitty. The angel is sweet. How interesting there are no eggs in this recipe. The muffins do look delicious. Awww such a beautiful blanket! I know they're going to love it. Your table setting as usual is lovely and the muffins look yummy as well! We are enjoying JULY-like weather here in Chicago so I'm hoping to sit out in my gazebo this afternoon and enjoy a cup of tea! What a delightful way to start a day! Will be trying your muffin recipe soon. I'm always looking for recipes using wheat flour as I'm prediabetic and have to watch the carbs, so I'm looking forward to trying these muffins. Your blue & white blanket is so pretty! Hello Kitty, I love the pretty baby blanket that you crocheted. I love making them for family and for donating to my church. The muffins look so good and I can't wait to bake them. Thanks for sharing at C&C with J&J. Enjoy the week. 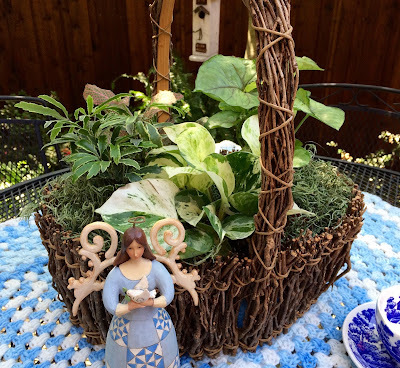 Hi Kitty!Love your blanket,so beautiful!The teacups are gorgeous too!I also love your plants basket.Your muffins look great,mouthwatering...Hugs. What a pretty blue-themed tea! 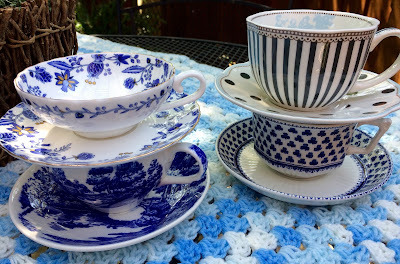 The teacups that your swap partners sent you are both lovely. I'm looking forward to finding out who I got paired up with this weekend! The crocheted blanket will be welcomed by the new little one and family. It matches perfectly with the blue and white teacups. I signed up again this time and will be curious to see who I'm matched up with. Yummy sounding (and looking) muffins! Muffins are my weakness, your recipe sounds delicious! Oh I like that baby afghan... I have a little great-nephew on his way... Yes, you have my gears turning. It sure made a pretty topper to complement your blueberry muffin tea. Kitty, the baby blanket is gorgeous! I love working with colors like that. It definitely makes the work lighter (not boring!). Pretty tea cups and yummy recipe. Thank you for sharing your lovely tea party with us! I have some whole wheat flower, thank you for a recipe I can use for it. How I love all these soft blue tones, Kitty! 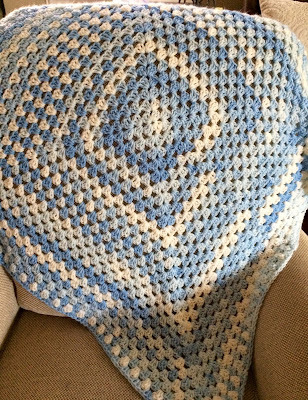 Your baby afghan is adorable & sure to be used & loved for many years. Love seeing the Jim Shore Peace Angel!!! While I'm not a fan of whole wheat anything, your muffins look quite yummy. Of course beautiful teacups & a setting like you've displayed would make anything look extra appetizing. Well done! Your muffins look ever so tasty and I must say your blue tea cups looked lovely with your muffins and blanket. Thinking of you! Love and hugs sent your way! Wonderful looking muffins, Kitty! Pretty teacups too. Your tea table looks very inviting especially with the basket of plants there. Someone will be very happy to receive the baby blanket. Have a lovely day. Hi Kitty! Your blanket is so sweet. Have not made a baby blanket in years. I sbould pick up those hooks again. I really do want to make some crochet pumpkins that you did last fall I believe. You have a very lovely tea cup collection. Blueberry muffins are a fave of mine. Hi Kitty, Love your gorgeous baby blanket. The color is beautiful and I too love the variegated yarn. The new baby and parents will love it. What a pretty fall table for tea with your blue and white tea cups. They are all so pretty along with Jim Shore's beautiful peace angel. Thank you for sharing the delicious muffins. They look so good and I will have to try these for sure. What a sweet gift for your friend's baby boy. Handmade with love is so special. I know your muffins are good with buttermilk! It makes things so moist. Your blue collection of cookie cups are so pretty. I always enjoy your posts. Kitty, I pinned this recipe - thank you. I love whole wheat breads, and the fact that you mention this being so moist is a plus for me. Your baby blanket is adorable. I still have the ones made for my girls when they were born. They're treasures! Anything whole wheat perks my ears and when you add blueberries to the mix, well, that's a WHOLE nuther story! And I think I might recognize one of those teacups. You did a beautiful job on the baby blanket too! Enjoy the rest of your week, Kitty! Kitty, I wish I could crochet - I'm sure it would take me so long to make a small blanket that if someone wanted to buy it I'd have to charge a thousand dollars for it! :D I want to try those muffins; they sound wonderful. Your Baby Blanket turned out so beautiful. I see another muffin recipe and they do look delicious. Thank you Kitty for sharing another wonderful tea time at your home. Kitty, the muffins sound wonderful and what a precious gift for the new baby. Beautiful blues my friend! Thanks for sharing with SYC. Kitty, I love the blue and white. The striped one I like best. Jim Shore angels are great. Have a great week. Sylvia D.
Great job on the blanket, it looks great. I always love your tea settings on your patio and your Muffins look delicious. Thanks so much for sharing with us at Full Plate Thursday. Hope you have a great week and come back to see us real soon! All this pretty blue is easy on the eye! 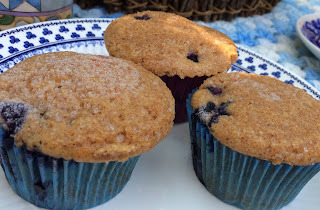 Blueberry muffins are a favorite of mine. I have not tried a whole wheat flour recipe but sounds good. I have tried whole wheat with my pumpkin bread recipe and I love it!Love all the pretty blue cups and that blanket is adorable. That is a skill I am sorry to say does not come easy to me. I wish I could do that! Such a lovely baby gift! I love the blanket! I just love to see handmade items. I have yet to make a blanket...though I knit, it takes me so long to do anything, homeschooling 4 kids, that I don't dare take on a project that big! ha, ha. The recipe looks delicious. Thank you!